The Hydraulic Assist Steering Toyota kit features a 6" X 1.5" stroke hydraulic ram with high temp inner and outer seals for long life and no leaks. For Dana knuckle applications we also offer an 8" stroke version. 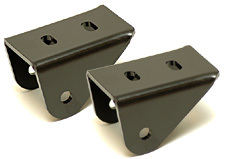 Easy to install brackets make installing this kit simple and the mounting hardware is specially designed to fit the Toyota axle and High Steer. Once the steering box has been tapped, installation of the ram takes about one hour. 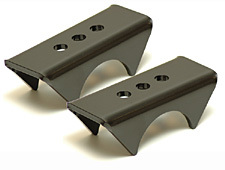 Each bracket is formed from heavy-duty 1/4" plate steel for extra strength. Fits 1979 - 1995 Toyota Pickup and 4Runner with solid front axle. 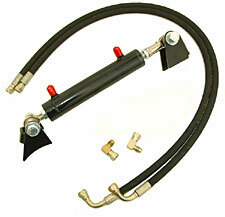 This kit takes all the guess work out of setting up a hydraulic steering system. The pump has an all steel housing and puts out 4.5 GPM of flow and 1650 PSI of pressure. All high pressure hoses are steel braided with crimped-on ends. 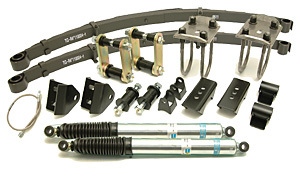 This kit is ideal for use with links and also works with most leaf spring applications. Solid Axle Swap Kits include a front diff armor plate, upper axle gusset wheel bearing and knuckle service kits. 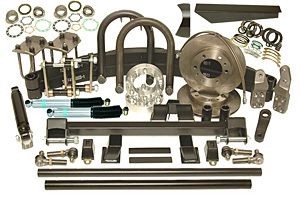 To install your solid axle kit you're going to need a rear matching lift kit, solid front axle from a 79-85 Pickup or 4Runner, and a long spline drive shaft. There are three different height options available . The hangers and shackles included with each kit add one inch of lift. Thus our 3" spring kit has 4" lift and our 4" kit would be 5" of lift. Rear Suspension Lift Kits feature long travel springs and shocks for maximum flexibility on the trail . 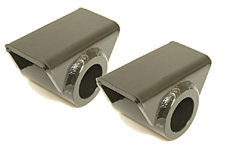 They are intended for use on 1979-1988 Trucks and for coil to leaf swaps on 90-95 4Runners . They are available in 3' , 4' and 5" configurations . Each Front Suspension Lift Kit includes a knuckle rebuild kit, wheel bearing kits, upper axle gusset and differential armor. Individual components are also available . Call us for details . 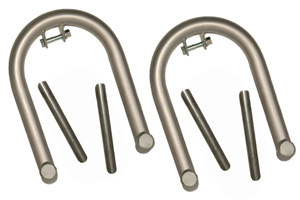 The Long Travel Shock Hoop Kit is long enough to accommodate a 14” shock but can also be used with a 12" Shock . The shock hoops are made out of 1035 DOM . From the top of the hoop to the bottom it measures 16”, and from the weldment mounting surface to the shock eye brackets measures 13”. Some modification may be required for propper instalation . When installing lifted rear leaf springs , it's best to rotate the pinion so it points directly at the rear transfer case output flange and use a CV style drive shaft . The best way to rotate the pinion is to cut off the old perches and weld in a new set at the proper angle . Normally the spring pin is installed in the center hole but you can also move the rear axle forward or backward 1" by using the optional holes. Made from 1/4 plate stee l. Unpainted finish. If you're installing longer rear springs you may need to relocate your rear shackle mounts , depending on your shackle angle preference . You can do this by cutting off the original units and re-welding them back on , or you can also cut off the old ones and install new ones . 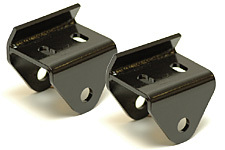 These shackle hangers use OEM bushings and are stronger than the factory shackle mounts . Unpainted finish . 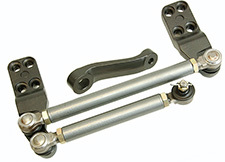 Installing longer rear springs requires moving the rear spring hangers forward on the frame. The factory hangers are too thin to cut off and reuse. These hangers weld under the frame, forward of the stock units. Made from 1/4" plate steel. Much stronger then stock hangers. 18mm bolt holes. Unpainted finish. Made from 1/4" plate steel. Much stronger then stock hangers. 18mm bolt holes. Unpainted finish. 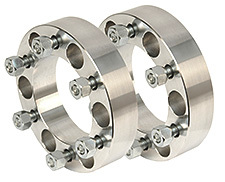 These bolt on wheel spacers are designed to give you a little more width without changing out your axle for a wider one . Great for use on solid axles conversions to make the front axle similar in width the wider rear axle found on 86 and up Toyota trucks . Bolt pattern is 6 stud on a 5.5" round circle . Features safety graded studs and matching nuts for proper fitment . Made from Billet 6061-T6 aluminum . Grade 8 Studs , Grade 10.9 nuts . Five sizes available . Shipped as a set of 2 spacers w/nuts . Every spacer features a precision machined surface . Only high quality nuts and studs that are hardness graded and stamped are used . Six lug wheel spacers fit Toyota FJ Cruiser , Pickups , 4Runners , FJ-40 , FJ-60 & FJ80 . For installing wheels and spacers this is the right tool for the job . 19mm on one end and 21mm on the other . Thin wall design fits better than standard sockets . This socket is rated for use with an impact gun . 1/2" drive.